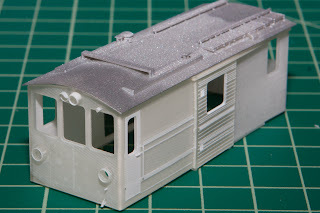 Yesterday I received the first draft of my latest project, the RhB De 2/2. I've been working on the model for a little over a month and have completed most of the upper body. This is the first full model I've attempted and it's been challenging to find a balance between true-to-life detail and printability. The model was printed by Shapeways.com using their Frosted Ultra Detail (FUD) material. Although the model is not complete, I printed this draft to see what level of detail is really feasible. As I suspected, some things worked and some did not. Some details broke off in production or shortly after I received the model, such as the long handrail adjacent to the cargo door. It was designed the same as the cab door handrails, as a 0.3mm diameter wire, but the extended length made it too fragile. The handrails on the cab door seem to be holding up well, which was surprising! The one big thing that I'll have to change is the cargo door. It was designed as two separate parts from the main body: the door and the upper track. 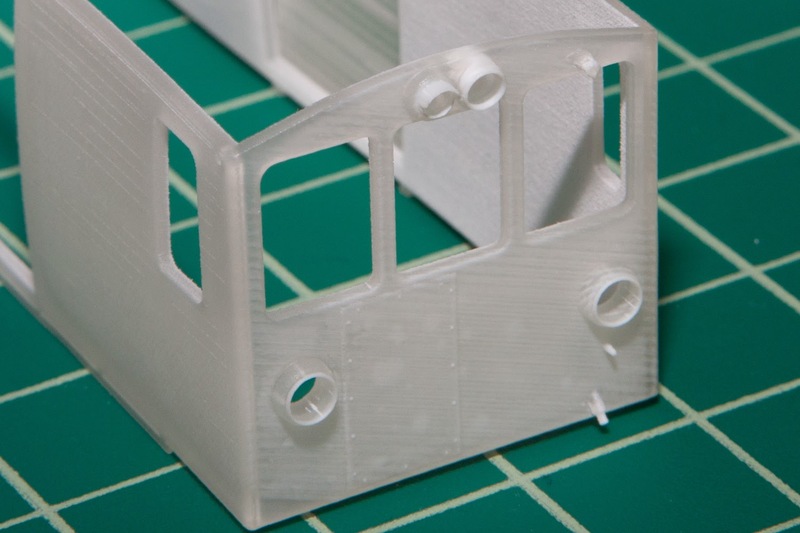 The upper track would attach to the body allowing the door to slide open as it would on the prototype. This actually works, although quite crudely since at the level of detail necessary to make the interlocking parts function the surfaces are relatively rough. However, the bigger problem is that the door and side of the main body are simply too thin to keep their flat shape. It would not be possible to use the FUD material and make the parts thick enough to function and be true to the prototype. Instead I'll attach the door permanently to the body and thicken the entire side from within the model. But overall, I'm very happy with the direction this is going! It's certainly encouraging to see the physical product. I've already completed most of the missing roof detail and the undercarriage is next. I'll post an update when I get the next draft. You can view the model on Shapeways at http://www.shapeways.com/model/1585157/rhb-de-2-2-151.html. I'm very excited about NolaTrains.com! My goal is to design parts that allow BEMO rolling stock to accept Kadee couplers without permanently modifying the models. Read more about my story on the About page. I've spent some time developing the parts in Google Sketchup and I'm having Shapeways.com manufacture some initial tests. If the testing goes well I'll open up the parts for purchase and post video of their installation and use. You can preview the parts in our store. Thanks for reading, I hope you enjoy the blog! © 2012-2014 NolaTrains.com. Simple theme. Powered by Blogger.